London joined cities across the globe in hosting anti-Donald Trump protests ahead of the US president-elect’s inauguration ceremony in Washington, DC. Protesters took action in more than 150 locations across Britain. A 25-meter-long banner reading “Bridges Not Walls” was dropped from London’s iconic Tower Bridge in the early morning. “On Trump’s inauguration day we’re taking action to show our support for groups under attack – here in the UK, across Europe and in the USA – and to reject the rise of a dangerous and divisive far-right politics,” said Bridges Not Walls campaign spokeswoman Nona Hurkmans. Freezing temperatures and mist did not stop protesters, who were supported by the Green Party, the Liberal Democrats’ LGBT group and environmentalist group People & Planet. 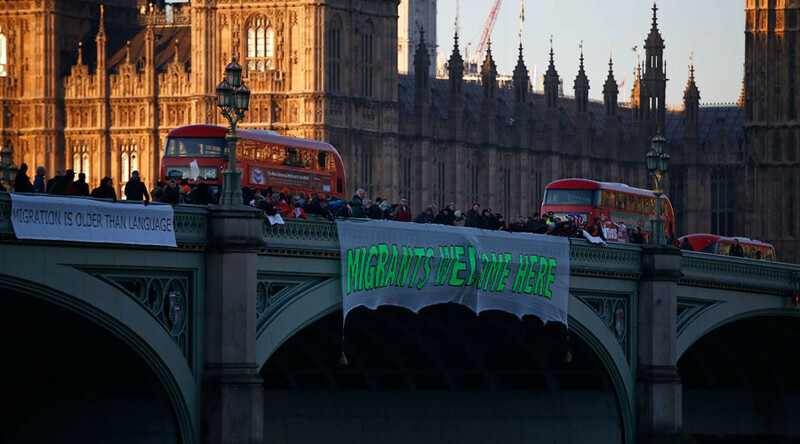 “We are part of a wider action going right across the UK about bridges not walls, that’s on the day of Trump’s inauguration to say we can be so much better than this,” Green Party co-leader Jonathan Bartley said at the Tower Bridge stunt. The campaign was reportedly the brainchild of an ice cream seller and homeless shelter worker in Hastings, Will Stevens, who was shocked by the result of the US election. Republican candidate Trump won the White House despite losing the popular vote with 46 percent of ballots against Democratic rival Hillary Clinton’s 48 percent. Similar actions took place in other world capitals, including Dublin, Rome, Berlin, Toronto, Sidney and even Addis Ababa in Ethiopia.